Are you looking for the perfect Mother’s Day gift? Something that’s hand made, unique and can be customized? 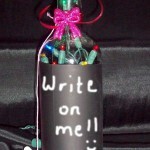 Our Chalk Board Bottle makes the perfect Mother’s Day gift for your Mom! 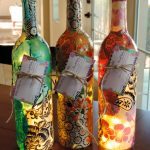 Two Wine Bottles With Lights We Donated To A Local Fundraiser. Nick’s brother Ben has a birthday coming up soon and his liquor of choice is Jack & Coke. 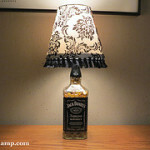 So, we stopped at our favorite watering hole and asked them to save us the next empty Jack Daniels bottle. 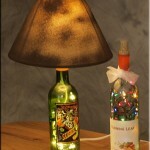 In the last year we have been giving numerous recycled Bottle Lamps away for local fundraiser and charity events. 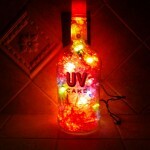 We, Nick mostly :), have made several of our lighted bottles into Bottle Lamps with Lamp Shades now. 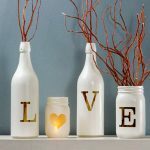 Our writable Chalk Board Bottle Lamps make a unique gift for your Valentine!